Many of you reading this know my mom, Margot Kuzma. You can find her on Facebook here, and for those who know her, she’d love to accept your friend request! My mom is a true survivor! She was born in East Germany, where she was raised during Hitler’s reign. During her adolescent years, she also survived three days in a concentration camp, where her family was placed because of her father’s refusal to join the Nazi party. She survived bombings during the war and at 17 years of age, escaped from East into West Germany by swimming over a river. It was the second attempt for the group of friends that escaped with her. The first time, they were caught and sent home. Her parents were told that if she was caught trying it again, she would never be seen again. Some know the interesting part of my story that she and my dad divorced back in the late 70’s, only to reconcile and remarry a year later! She’s one tough lady with a huge heart. She taught me and my siblings the value of hard work. She spent her adult career serving others as an in-home nurse for elderly patients. During her adult life, she bore five kids, losing my oldest brother to AIDS in 1994, when he was only 33 years old. 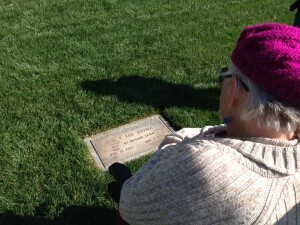 She had lost her oldest grandson, who only lived a day. In the late 90’s, she lost a kidney and had to have a bypass performed on the remaining one. Back in 2007, at 73 years old, she survived major surgery to repair an Abdominal Aortic Aneurism. Any who know what that is know that it’s a miracle for anyone who endures it. About 3-4 years ago, she had to have her carotid arteries along both sides of her neck cleaned out. They literally call the procedure “roto-rooting”. Last year, she went through hip replacement surgery. Since then, she’s had some difficulty recovering, but has done her best to keep going. In November, she and my dad celebrated their 50th Anniversary! 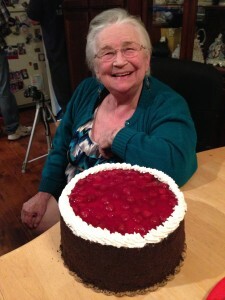 In December, Mom turned 80 years old. You can’t really tell, other than her need to use a walker due to some arthritic issues. After all she’s been through, I’m honestly somewhat disappointed to share that today, we found out that Mom is facing one of the largest battles in her life. She was diagnosed with Small Cell Lung Cancer. You can read more about it at the link. It all started with a call from her vascular surgeon at UCLA. He wanted her to come down for an ultrasound to check on the condition of the carotids. I took her down, and it turned out her carotids are doing great. However, they happened to discover a mass on the left side of the neck. A follow up CT scan of the head and neck revealed that the mass was an enlarged lymph node that was suspicious of malignancy. The same CT scan caught the upper lobe of the right lung, which showed a mass there. Another CT scan, this time of the chest, revealed 2 or 3 more masses in both lungs. Last Friday, a biopsy of the lymph node was done. Today was the day we received the results of Small Cell Lung Cancer. It turns out that this kind of lung cancer has only 2 stages. “Limited” means the cancer is only in the organ of origin, in this case, the lung. “Extensive” means it has metastasized (spread) outside of the organ. Mom’s staging is “extensive” because her neck lymph node already contains the cancer cells. The doctor was not willing to give any kind of time table, believing that know one knows how much time any of us have left, even with this disease. The pulmonologist said it’s not curable, but it is controllable with chemotherapy. On Monday afternoon, we’ll see the Oncologist to find out what they will recommend from here. Although Small Cell Lung Cancer is aggressive, it also responds well to the chemotherapy. For Colleen and I, we’ve supported several of her family members through bouts of cancer (2 bouts with her Mom, 1 bout with her Dad, 2 bouts with her sister, and Colleen herself has had thyroid cancer), but this is the first time a family member on my side has ever been diagnosed with cancer. We haven’t said much because we didn’t want to get too far ahead of ourselves, and were obviously hoping that the diagnosis would come back with something other than this. We certainly appreciate your thoughts and prayers as we enter this new territory as a family.